From a theoretical perspective, building a planet is not easy. Of course, planets do form–we’ve discovered hundreds of them! (This is a bit like the old claim that, according to the laws of aerodynamics, bumblebees can’t fly.) In a clash between theory and observations, observations win. What’s even more difficult than forming a planet around a star? Forming a planet around two stars! Circumbinary planets were science fiction until the discovery of Kepler-16, a Saturn-mass planet that orbits a K star and M star. Theory was confounded, science fiction became science, and Tatooine was dutifully referenced. In this paper, Meschiari dives into planet formation theory and comes up with a mechanism to build circumbinary planets. It is worth noting that this paper only considers the case in which the planet orbits both stars; the situation where the planet orbits one of the two stars in the binary is considered in these astrobites. What’s the Matter with Binaries? According to one theory (referred to as core accretion) planets form when particles, starting with microscope dust grains, collide and stick to each other, growing into progressively larger objects. When these building blocks reach about a kilometer in size (now called “planetesimals”), the extra gravitational perturbations from the stellar binary cause the planetesimals’ velocities to increase. Consequently, collisions result in the planetesimals breaking each other apart rather than sticking together, effectively quenching the planet formation process. If a planetesimal could somehow skip this stage and get even larger–at least 100 km in size–it would become essentially indestructible and could continue growing into a planet. The solution to this problem, as presented by this paper, relies on a feature called a “dust trap”. The protoplanetary disk in which planets form is composed of both dust (solid material) and gas, and while dust is the dominant player in the first act of planet formation, gas has an important supporting role. The “Keplerian velocity” of a solid object–like a planetesimal or dust grain–is determined by setting the inward gravitational force equal to the centripetal force required to keep the object in orbit. A disk of gas in orbit behaves slightly differently; the force of the pressure gradient must also be accounted for, which changes the gas’s orbital velocity. If the gas pressure in the disk decreases outwards, the gas will orbit at a sub-Keplerian velocity. A solid object (which wants to orbit at the Keplerian velocity) will feel a head wind from the gas, causing the object to lose angular momentum and spiral inwards as it orbits. On the other hand, if the gas pressure increases outwards, the gas will orbit at a super-Keplerian velocity, so a solid object will feel a tail wind, increasing the object’s angular momentum so it moves outwards. The net result is that solid material will collect at a gas pressure maximum–this is the dust trap. As luck would have it, the gravitational perturbations from a stellar binary (in addition to starting this whole problem) create a pressure maximum in the gas near the inner edge of the protoplanetary disk, around 1 AU. In other words, the binary creates a dust trap! So how does this trap help solve the problem? 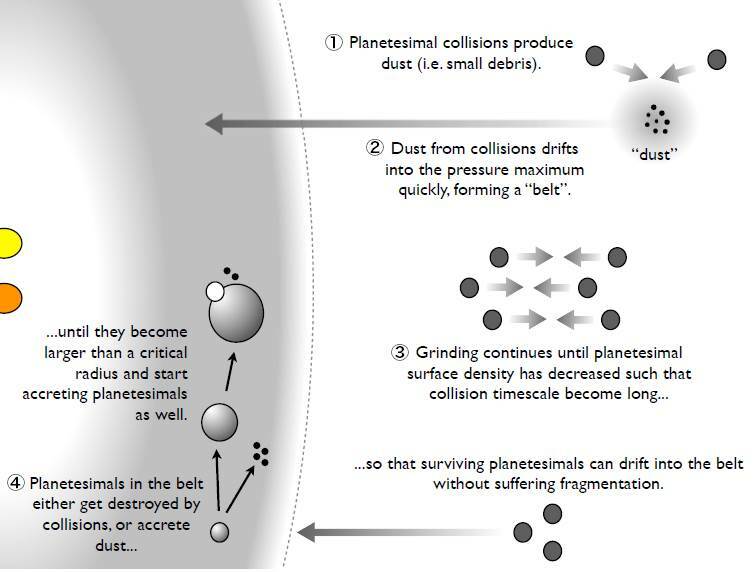 First, dust created by the high-velocity planetesimal collisions collects at the location of the trap, creating a narrow belt of concentrated dust (this is the “debris disk” referred to in the paper’s title). The planetesimals, which drift more slowly, eventually arrive at the location of the trap. There, they can sweep up the concentrated dust and quickly grow to indestructible objects, bypassing the problematic stage. The bulk of this paper describes how the author used simulations to model each stage of the process, verifying the plausibility of these planet formation mechanisms. A diagram illustrating the process by which planets can from around binary stars. From Figure 1 of the paper.